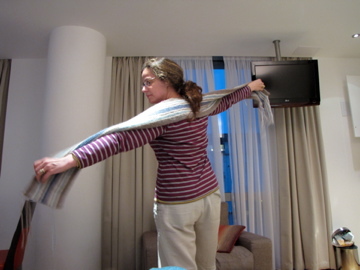 UK Travel Scarf: And Now The Exciting Conclusion | Knit Like You Mean It. The scarf is finished...all but the fringe. You have to have something to look forward to, right? Oh, and that background is our crazy London flat. Kathleen and Andy take a very long trip, and Kathleen decides to knit a very long scarf. Leg One: Conductor’s irritation at unnecessary 4-minute delay. Scarf at one row out of 54. Leg Two: Several friendly Scots offer encouragement. Scarf at 7 rows of 54. Leg Three: Lunch in Carlisle prompts gratitude at not having to sleep there again. Scarf at 18 / 54. Leg Four: The trip to Wolverhampton includes some reflection. Scarf at 23 / 54. 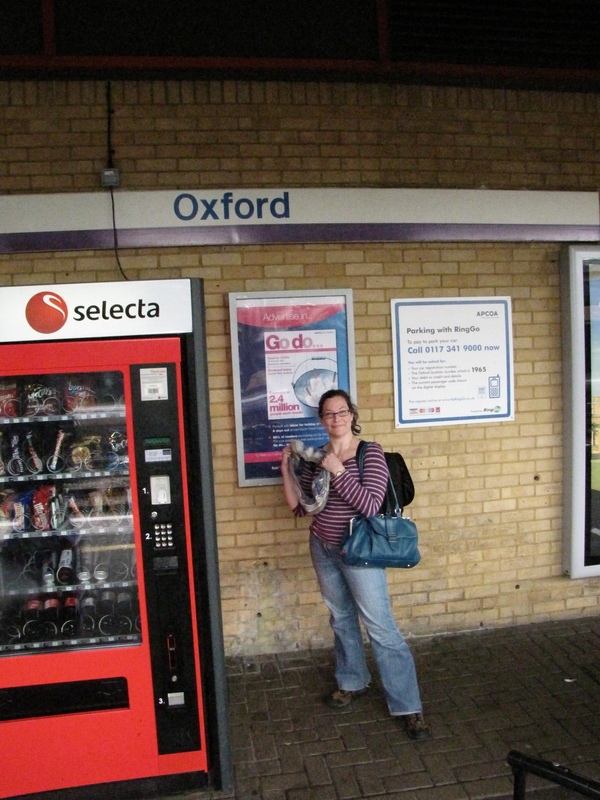 Leg Five: The trip to Oxford is the last one for the night. Scarf at 29 / 54. And now…the final day of the UK Travel Scarf Tour (2010 edition). Leg Six: Oxford to London. One hour, 19 minutes (predicted to be much longer). Feeling much cheerier after a night and morning in Oxford. Also, that vending machine next to me? Sells Cadbury. Yes indeed. We woke up in lovely Oxford, only slightly depressed by lukewarm showers at our charmingly-askew hotel. All such problems are swept away by a trip to Blackwell, and so to Blackwell we went. I snuck in a row on the scarf between bites of gluten-free brownie in their cafe. 30 rows out of 54. After that, we walked around Oxford for a while, picked up the extra bag I’d left behind at Lincoln College (reunited with yarn from Knit Nation 2010! ), and hauled everything down to the train station. We had a brief wait on the platform: 31 rows of 54. So let’s stop for a moment and realize that, in 9.5 hours of traveling on Day I, we rode several different trains without a hitch. Five legs of a journey, four different rail companies, and yet the worst thing we faced was that four-minute Get-Yer-Foot-Outta-the-Door delay. Pretty impressive. So I am happy to give the British rail system a pass on what was a somewhat odd final trip. I’d looked up the train the night before: we were taking the 14:05 from Oxford to London Paddington. No changes, no nothing. But when we got to the station the 14:05 was listed as only going as far as Ealing Broadway, and when I asked the extremely helpful man at the station he said we’d need to change at Didcot Parkway to get to Paddington. This sounded fine to me, especially since I needed to finish the scarf so the more travel time the better. When we got on the train and the little digital display said we were going to Paddington, I took the bad news well. Sure, we’d get there in a little under 90 minutes, but then we’d be in London, and, heck, London is nice and the scarf doesn’t need to be finished exactly on time, right? You see what a good sport I am. I was now done with the middle stripe: 38 rows of 54. That had to be good enough. I considered casting off in London, no matter where I was in the stripe pattern. 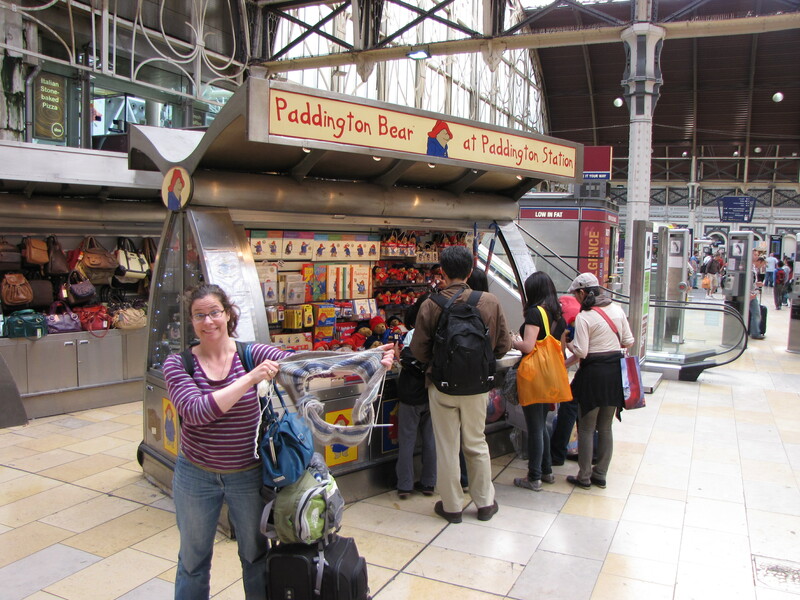 The Scarf at Paddington Station: Did Paddington Bear wear a scarf? I can't remember. A few moments later, our conductor came around, and he told the woman in front of me that we’d get to London Paddington at 16:45. That didn’t add up…sure, the math was going my way, but when does that ever happen? I’m a knitter. I know all about math working against me. Heck, I was on row 39 of 54! Still, he stressed that we certainly wouldn’t get in before 16:45, explaining that it was Sunday, certain tracks were closed, there had already been delays, etc. Even as we passed station after station with their little light-up boards announcing that our train was arriving ON TIME, I knit happily along, secure in the knowledge that the conductor knew best and I certainly had at least another hour to go. Plus, I was on row 41! Practically flying along. 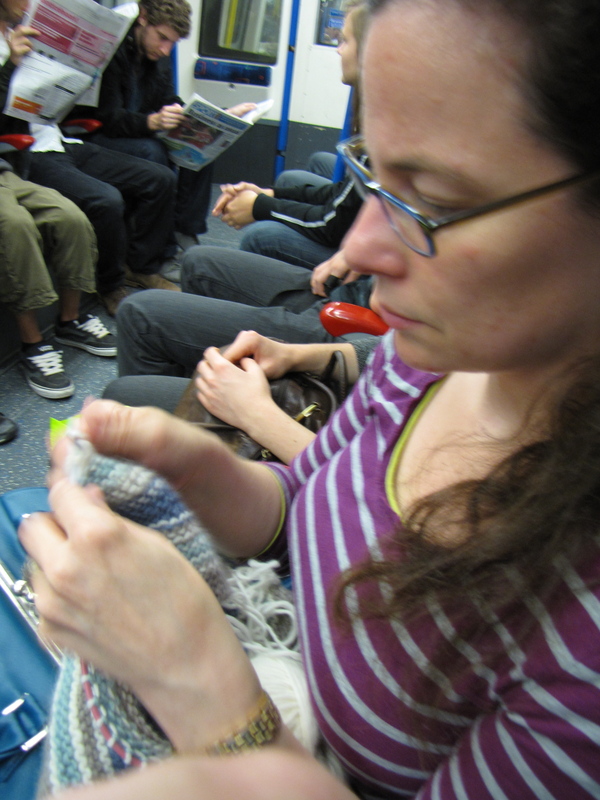 Knitting on the London Underground. See how close I am to finishing? Not so (you knew this was coming, didn’t you?). We arrived the same way Andy Bernard graduated from Cornell (and anger management): on time, at 15:47. We might even have been a minute early. I didn’t believe it when we got to the penultimate stop at 15:35; I just thought, “Wow, it’s a long way from Ealing Broadway to Paddington.” I almost didn’t get off when we got to Paddington. Mr. Trask had to be very firm with me. He finally lured me out with the promise of a photo in front of the Paddington Bear Shop. So, can I blame the UK trains for keeping me from finishing the scarf? I guess I can’t. The London Underground was awfully helpful. Just please don’t remind me I’m about to go back to DC in August, where the last thing I need is a scarf. Maybe I should knit myself a bikini on the plane. The scarf is terrific, and the story behind it is even better. You must go with the knitted bikini for your next WIP, maybe for the return flight? It’s appropriate for the (ridiculously hot, humid, oppressive) summer here on the East Coast. And we will need pictures. Paddington, the bear from Darkest Peru, wore a dark blue toggle coat, and a red scarf. I love the story — and the scarf looks terrific. The DC area is making itself cool and habitable in your honour. Thanks, Denise! You’re so right about the red scarf. Maybe that will be my next travel project…certainly would look better on me than a knit bikini! Love your blog – and esp. 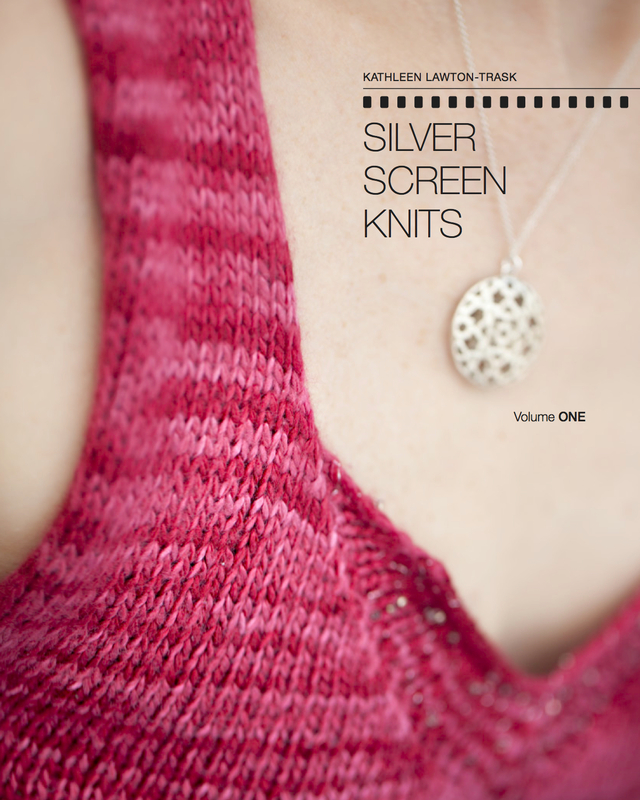 reading about your train-knitting adventure. Carlisle is home for me, so I’m sorry that you didn’t enjoy your stay (although I completely understand!) – what was the name of the awful hotel? Hope you have a good trip home! Thanks so much! I was serious when I said that Mr. Trask and I liked Carlisle – especially the gluten-free cafe and the gorgeous cathedral. The hotel problem was so horribly unique that I hesitate to give the name. I’m afraid that did color our experience a bit – but we’d go back! What’s your local yarn shop there? Fair enough! We’ve got a couple of shops – the ‘Superior Sewing Centre’ (http://www.sewingknitting.co.uk/), which is at heart a sewing machine shop, but with an upstairs dedicated to knitting, and ‘Fun 2 Do’ (http://www.fun2do.co.uk/),which is a proper treasure-trove of a craft shop full of everything you could ever want, including wool on sale! I am glad you enjoyed some of the visit – despite the hotel! I enjoyed reading this story tremendously. I particularly liked the helpful Scots in the earlier parts of your journey. And what’s the next public transportation project now that you’re back in DC?? Hello! My latest post is about the scarf I knit on the plane home…and there might just be a matching hat soon. Am I obsessed or what?